Home > Blog > We have a new website! We’ve tried to make it easier for everyone to find out about the Callan Method and our courses. Students can find a Callan Method Accredited School near them. Schools and teachers can learn more about working with the Method. 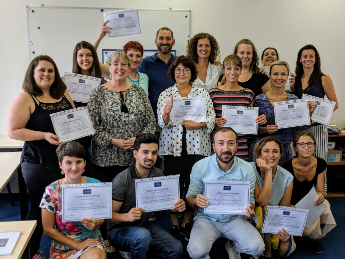 Many Callan Method friends around the world have contributed testimonials which describe the experiences of both teaching and learning with the Method. One of our favourite quotes, from a student at Volis Academy in Slovakia, describes a Callan Method lesson as: “Like a chipmunk on speed riding a bike running on liquid helium”. Callan is never boring! We have simplified the website and we no longer duplicate all the commercial information, terms & conditions, style guide etc which our partners can find in CASA (Callan Accredited Schools Area). You can log into CASA as usual or use the Log In link at the top of the website. As we only sell our books and materials to Callan Method Accredited Schools and Registered Teachers, we have moved the Online Shop into CASA. To get to the Shop please log in to CASA in the usual way or use the Log In link at the top of the website, follow the link to the Shop and log in there with your usual Shop log in. If you have any comments or suggestions please do let us know!